Discovered by Abraham Ihle in 1665. Messier 22 (M22, NGC 6656) is one of the brightest and remarkable clusters in the sky, and in paticular of those observable from mid-northern latitudes. It was the first of these objects to be discovered. This was probably the first globular cluster discovered, by Abraham Ihle in 1665. According to Kenneth Glyn Jones, it is supposed (e.g. by Admiral Smyth) that Hevelius may have seen it even earlier, but Halley, De Chéseaux and Messier commonly acknowledge Ihle's original discovery. This globular was included in Halley's list of 6 objects published 1715, and observed by De Chéseaux (his No. 17) and Le Gentil as well as by Nicholas Louis de Lacaille, who included it in his catalog of southern objects as Lacaille I.12. Charles Messier, who cataloged M22 on June 5, 1764, states that it is also included in John Bevis' English Atlas. M22 is a very remarkable object. At 10,400 light years, it is one of the nearer globular clusters. At this distance, its 32' angular diameter, sligtly larger than that of the Full Moon, corresponds to a linear of about 97 light years; visually, it is still about 17'. 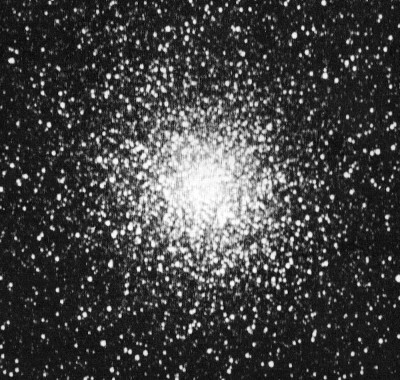 It is visible to the naked eye for observers at not too northern latitudes, as it is brighter than the Hercules globular cluster M13 and outshined only by the two bright southern globulars (not in Messier's catalog), Omega Centauri (NGC 5139) and 47 Tucanae (NGC 104) - this is the ranking of the four brightest in the sky. While Shapley and Pease counted 70,000 stars in this great stellar swarm, only the relatively small number of 32 variables has been identified, half of them already known to Bailey in 1902, among them a long-period Mira variable which is probably not a member. The brightest stars are about mag 11. The stars are spread over a region roughly 200 light years in diameter, and receding from us at about 149 km/sec. This cluster is notable because it contains a weak planetary nebula, discovered by the infrared satellite IRAS and cataloged as IRAS 18333-2357 or GJJC 1. This planetary was the second discovered in a globular cluster after Pease 1 in M15, and one of only four known planetary nebula in Milky Way globular clusters. 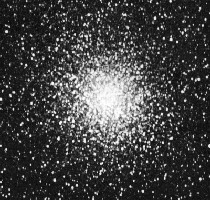 Recent Hubble Space Telescope investigations of M22 have led to the discovery of a considerable number of planet-sized objects which appear to float through this globular cluster; these objects may have masses of only 80 times that of Earth, and were discovered by so-called micro lensing effects, i.e. bending of light of background member stars of the cluster. For the observer, it is of interest that M22 is less than 1 degree of the ecliptic, so that conjuctions with planets are frequently conspicuous.